Austrian publisher and merchant; born March 25, 1812, at Brody, Galicia; died Oct. 2, 1890, at Geneva, Switzerland. He was one of the wealthy Galicians who took delight in encouraging and spreading the new Hebrew literature. He visited Switzerland and Italy on a pleasure trip in the summer of 1834, and in the latter country met S. D. Luzzatto and J. S. Reggio, with both of whom he corresponded on literary subjects. He lived for several years in Odessa, between 1840 and 1850, and afterward returned to Vienna, where he remained until 1885, from which year until his death he lived in Switzerland. 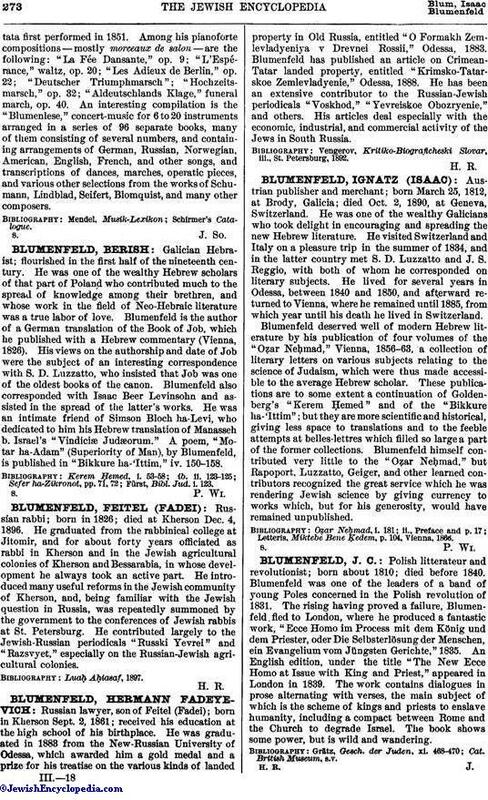 Blumenfeld deserved well of modern Hebrew literature by his publication of four volumes of the "Oẓar Neḥmad," Vienna, 1856-63, a collection of literary letters on various subjects relating to the science of Judaism, which were thus made accessible to the average Hebrew scholar. These publications are to some extent a continuation of Goldenberg's "Kerem Ḥemed" and of the "Bikkure ha-'Ittim"; but they are more scientific and historical, giving less space to translations and to the feeble attempts at belles-lettres which filled so large a part of the former collections. Blumenfeld himself contributed very little to the "Oẓar Neḥmad," but Rapoport, Luzzatto, Geiger, and other learned contributors recognized the great service which he was rendering Jewish science by giving currency to works which, but for his generosity, would have remained unpublished. Letteris, Miktebe Bene Ḳedem, p. 104, Vienna, 1866.